Former 2-time IBF Bantamweight champion of the world, Joseph King Kong Agbeko (31-5, 23 KOs) makes a return to the ring again next month when he takes on experienced Kenyan slugger, Nick Otieno (31-11, 13 KOs) at the Bukom Boxing Arena in Accra as part of Ghana’s 60th independence anniversary celebrations. 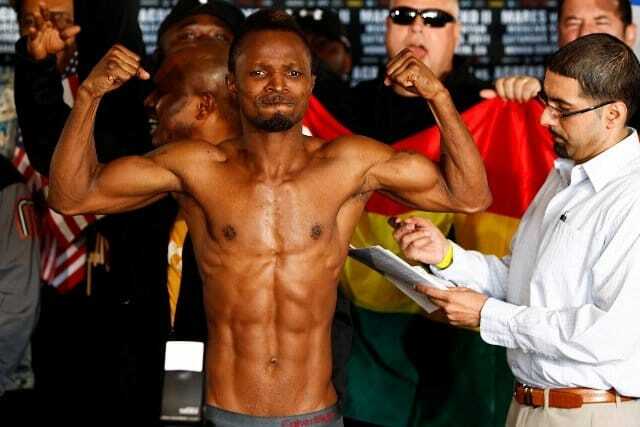 The Kenyan currently holds the WBA Pan-Africa Super flyweight belt he won back in February this year via a unanimous points’ victory over Tanzania’s Haji Juma, the same boxer Agbeko defeated in his last fight at the Accra Sports Stadium in October last year. The promotion sponsored by McDan Shipping Limited, Gold Line Mining, Special Energy Drink, Stanbic and Kenya Airways as official airline sponsors as well as Oceanic Resort as official hotel, will also feature on the undercard Ghanaian world title hopeful, Patrick Allotey (35-3, 28 KOs), a former Ghana and WBC International silver welterweight champion against a yet to be confirmed opponent. Las Vegas based Montenegrin, Milorad Micko Zizic (12-2, 6 KOs), a former WBC Mediterranean and IBF Youth Middleweight champion who like Agbeko, is signed unto Roy Jones Jnr Promotions, will also make his debut appearance on the African continent at the Bukom Boxing Arena come June 9 against an opponent that will soon be named. A host of other promising young Ghanaian boxers are also set to be announced to fight on the bill when the full list of fixtures are made public by Fresh King Entertainment who have promised to stage a grand event key to regaining Ghana’s place on the high tables of world boxing.